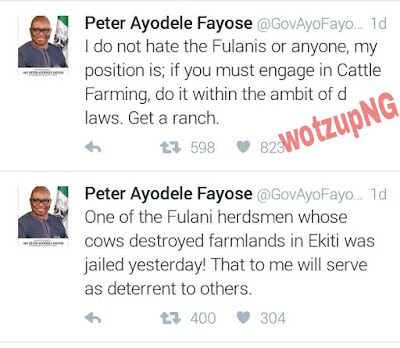 The Governor of Ekiti State, Ayodele Fayose has stated clearly in series of tweets that he does not hate the Fulani Tribe in Nigeria but simply against the activities of Fulani Herdsmen. Fulani Herdsmen have been engaged in multiple killings and destruction of farm lands across the Country, mostly in Benue State and some Southern Nigeria States. 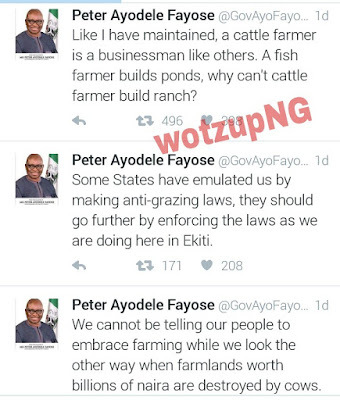 Governor Fayose advised those involved in Cattle business to do that in the confines of a ranch so as to prevent the destruction of farm lands. We are one people no matter our diversity but, I think we should have laws really guiding the gazing scheme. Why enter people's farm to destroy? Create ranges for yourselves so that peace can reign.